Peter Whittingham would be a good signing for Newcastle. | NUFC Blog. 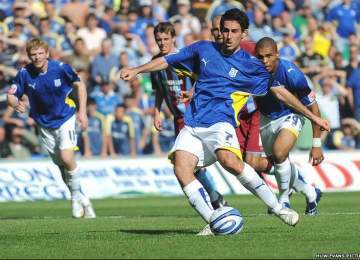 Peter Whittingham would be a good signing for Newcastle. Whittingham - Would be a great deal for Newcastle. Despite the fact that Newastle put in an assured and comfortable performance against Deportivo last night, few can deny that the squad still needs strengthening. One of the areas that concerns me is out on the wing, both of them actually. Wayne Routledge and Jonas Gutierrez are likely to be our first choice wide men this season, but what happens when injury or suspension strikes either of them? On the right, we may just about be alright for a short period as we have Ryan Taylor who can cover there. It wouldn’t be ideal, but he could do a job for a short amount of time. Mind you, I would still like to see it strengthened. What about the left hand side of midfield though? What happens if or when we are missing Jonas Gutierrez? In pre-season we have either played a striker or a central midfielder wide on the left, which is far from ideal. The problem with trying to cover the position currently occupied by Jonas Gutierrez is trying to find someone who would be ok with playing second fiddle for a while. Or alternatively, you could make sure that the player bought can cover in a few positions to increase his game time. Step forward Peter Whittigham, who would fulfill that criteria, certainly he would fill the second part of that criteria as he can play in a number of midfield and attacking roles, including out wide on the left. Whittingham had a storming season in the Championship last season and scored 25 goals, more than any of our players could manage. He also hit the woodwork nine times and racked up ten assists throughout the course of the season, which isn’t bad at all. He is also a left-footed player, which is something we are lacking at the moment. In my opinion, Whittingham is one of the best players outside of the Premier League, within the English league structure of course. I have been a long time admirer of his and firmly believe he could come to Newcastle and do a job for us. His current club, Cardiff, are suffering a cash crisis at the moment and have just rejected a bid of around £1 million from Nottingham Forest for the services of the player. I think we could get him for £1.5 million, which wouldn’t be a bad bit of business at all. I know Whittingham is a name that isn’t as exciting as a Ben Arfa for example, but I still believe he could do a job for us. I’m not of the school of delusion that thinks we could get a Schweinsteiger or an Anelka, those kind of thoughts are out of touch with where the club is at the minute. Nothing wrong with being a dreamer though I guess. What we need are players who have a point to prove, of which Whittingham is one. Even Ben Arfa, should we end up getting him, has a point to prove, which would be great for us and would add that bit of flair and guile we are missing. Getting both would settle my mind wiith regard to the wide positions and leave me feeling more comfortable about the state of our squad. Anyway, it’s just my opinion, like. I cannot really remember him when I was at the CC Stadium … which speaks volumes … in fact I think he was subbed! Is he really good enough for the premier league? that sound s a bit misleading … i was never part of the Cardiff city squad … I just happened to be in the away end when newcastle were in town. Shrews – I was there too and didn’t really remember him, but 25 goals from a midfielder, with another possible 9, and ten assists, has to mean he done something right against the rest. I mean, that is better than Nicky Maynard are people are foaming about him. fair comment toonsy … coud certainly do with the goals this season !!! like I said on the other thread tho Toonsy take away last season and he’s had an average career.At Cardiff 130 odd apps and 30 odd goals 25 of which were last season.I’m not saying he’s not a good player just that is he as good as last season makes him appear? I’m sure sky said forest had bid £1.5m so I think he’d cost £2m+ so maybe worth a punt at that.I’d like winger/wingers who aren’t bought as cover but who will challenge Jonas and Routledge for a starting place.If we continously just keep buying players as cover we won’t improve as a team and I certainly don’t want to sign any player who is happy to be on the bench. im from cardiff guys and all my mates are city fans, and even they dont think he would improve our squad. but would not be impressed if we signed him, build for the future, buy weiss. Rich – I dunno mate. I’ve said on here before that I think he is a good player and was surprised when Villa let him go. His goalscoring may be good last year, and it may be a one off, but his assists are still high throughout his career. Nasher – No worries mate. What I meant about Weiss is that he is happy to stay at City, which is fair enough I guess. The problem with City is that they have absolutely no need to sell any player at all, so when they do you can bet it won’t be done cheaply. What I am looking at is players who could cover for us. Whittingham would be better than we have at the minute, which is none, and would be at a price we would be likely to pay. I agree Toonsy,said he’d be worth a punt but just don’t think people should just judge him on last season.I also think we should be looking at a buy or 2 who’ve played at a higher level as we need to improve the quality and not just bulk up the numbers. i must admit one the few occassions i’ve watched whittingham,he’s flattered to deceive to be honest. maybe the games i’ve watched,he may have had an off night.i just dont know enough about him,is he worth a punt possibly at 1.5 million,although have forest been knocked back with a bid in the same ball park?if cardiff are wanting more,then might not be worth it to be held to ransom. where is that adel tarabt sorry if the spellings wrong,i think he has potential,wheres he playing now?is he still on the spuds books?can be a heedless chicken at times but has good ability if he could be brought on properly. It depends on the size of CH’s transfer kitty also,£2m isn’t alot but could be the difference between signing a better quality player proven at a higher level or not.Every signing is a gamble tho so guess we can just trust in CH’s judgement and see what we have come the end of the month. if on the other hand spolit little sh1t chopra gets his way (just came out threatened to leave and cause a mass exodus) maybe. only if it was dirt cheap, wouldnt want to dent what hughton has left. but agree he would be a good backup player at most lower teir premership sides. Big no to Whittingham, would rather Chris Burke. Neither would happen. Last night for all the positives and there were lots, I still think we are crying out for a pacy, creative player to buzz around Carroll. Gootrie, Barton and Nolan were good kept possesion well at times and not a smudge in sight, We didnt hoof it long all the while, Solid at the back without some of our names. Just need that number 10 to play off carroll, some competiton for the wingers and a left back and were ready IMO. CC “Just need that number 10 to play off carroll, some competiton for the wingers and a left back and were ready”…………agreed,doubt we’ll get all but 3 out of 4 would be nice. Someone said we’ll only get better if we buy better players. I think its possible to improve as a team by continuing to work hard in training. We do after all have a lot of youth in our squad now who, with the aid of Hughton and the seniors pros, should only get better. Therefore it follows that as they improve we should improve collectively as a unit. Now I’m not say we don’t need to buy anyone or we shouldn’t, I just think some people are too ready to associate success with money. We’ve seen first hand that it isn’t always the case. lads dont u agree we need to play 451! so we can have more of the ball.we looked solid thats a good thing.if we do get another winger then why not give jonas a go in a free role behind carrol.we would be a lot more mobile with 2 wingers and jonas.giving them freedom with 2 sitting midfield players.the way it is going he has got to many strikers and playing 442 with these srtikers doesnt work for me becsue they are not good enough.carrol is good in certain ares but not mobile enough to get in the box if routlegde breaks to get that tap in.but ranger is more mobile and has got a better eye for goal then him.not saying he is better but we have got to get people in the box to score them goals. If Whittingham’s that good, why is he still on Cardiff’s books then? Why hasn’t he been snapped up already? Whitingham is one off a few players outside the PL with that little bit of quality in the final third; whether that may be an eye for goal or his final ball. It baffles me that a player who scored and created as many goals as he did last season isn’t considered by some as a positive potential signing! As it has been mentioned he can also fill in at left back; but he is more of a wide midfield player than a winger (i.e. he is not the type to go past a player with pace or get to the byeline; more likely to hold his postion out wide, work back and look to get crosses in first time or get into the box). For me Jonas is an axciting player and a real threat at home; i feel whittingham could do a great job away from home when it is roll up your sleeves time and all about working for a result. With limited funds available; if we could pick him up for 2-2.5 million then i think that would be a great improvement to the squad. I must add that for me the perfect loan signing for newcastle this season would have to be carlos vela. I watched arsenal in the emirates cup and chamakh looked a gem of a player who is more than likely to play. Then on top of that they have Van Persie, Arshavin, Bendtner, and walcott who can play upfront! If mr. wenger wants vela to play regular games then i’m sure we could find a place for him at newcastle! @ 24 what’s the name of the blog your starting – talking shite with chicken – leave the footy blogs for those who know what their talking about. TC….think ya mean me,yeah you’re right saying the team can improve via training,young players coming through etc.I just meant we should also be looking at players who will challenge for a first team place and not purely to cover injuries.I’m not saying go out and spend massive amounts on average players who don’t add anything to the team but I’d rather spend £4/5 million on a good quality,hungry player who could challenge for a starting place and improve our first team than buy two £2m players who will only ever be good enough to cover injuries(not saying CH has done that either). Are we even after him? I think hes keen to stay at cardiff..
Would he really want to play second fiddle, isnt that why he left villa? for 1st team football..
Is he really good enough, the Championship league is a little deceiving IMO..
couldnt we play Lua Lua there or Frank Danquah, it would save us money and utilize our reserves..
Agree good player but the worry is that no one else fancies him ? You know there are a few others that spring to mind but clearly are not fancied to make the step to premier leauge, young Vuick is probably more fancied as the leftfooter we all agree we need. I actually think we need to ship some players out !! now theres a debate ?? are we serious about all our mid fielders being good enough are we sure Shola can cut the mustard. Every question has a question and very few answers. Was reading that poyet is in one because we supposedly agreed to loan them lua lua last week but we are now stalling because we might need him. Might have something to do with a glitch in a signing, still hope we’ll buy a pacy attacking player. you do very well toonsy – but bbm is 100% correct saying you struggle with criticism. do as uncle ed does = it all goes over his ed. Some would say otherwise mind…..
442 with just ‘big units’ up top doesn’t work. Carroll can’t hold up play, great header though. & i’ve been saying Jonas in the middle for …………ever. like silly sod says: Add to cart! & you live in a zoo. have you asked for his hand mate? Richie@44, – This info came from Doocey on Tyne Time, 24hrs before the Chron but the fact they are going with the story shows there could be something in it, fingers crossed. Maybe his training ground bust ups would be a worry tho. We could do with a creative midfielder but im sure every single other team would say that. Ben Arfa would be good to add someting different.